Ok people, time to try something different. How about rebooting or shutting down your computer from system tray? Sounds cool isn’t it? Well, it’s certainly a good idea for people like me who are lazy to go to start menu and then choose shutdown. Sometimes when I don’t like waiting for the computer to shutdown I use the instant shutdown method which shuts down pc in less than 5 seconds. There’s an app known as iPower which allows you to shutdown and reboot your pc from the taskbar itself. Once installed it adds a small icon in the system tray. You can right click on it and configure it. 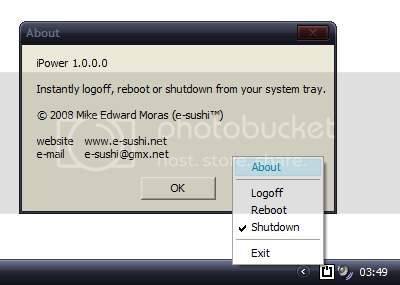 You can choose whether to logoff, reboot or shutdown. The default option after startup is “shutdown”. Now whenever you double click on the icon it will do what you had configured it to do. Easy isn’t it?